ESCONDIDO, Calif., Nov. 28, 2018 /PRNewswire/ -- Ancon Development Corporation, a leading designer and developer of advanced facilities, today officially announced the launch of its AGT Hybrid Greenhouse, a new approach to advanced greenhouse technology. The hybrid structures have transformed traditional plastic covered greenhouses into modern, insulated, sealed, natural light, cleanroom laboratories with unmatched energy efficiency. Learn more at http://agtgreenhouse.com. The AGT Hybrid Greenhouse is a new approach to advanced greenhouse technology. AGT's proprietary Natural Earth Air System has three air chambers, one using swamp cooler technology, another for heating and the third for air conditioning. The AGT Greenhouse system is copyrighted and under provisional patent protection due to its proprietary features. 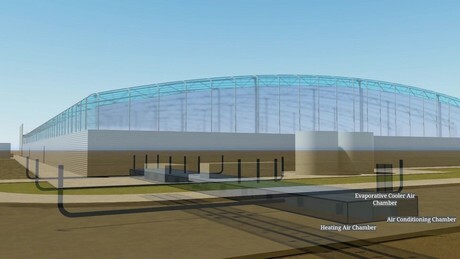 The greenhouse includes a sealed, cleanroom laboratory environment with variable daylighting control, which is perfect for medical plant research, plant testing for new hybrids through DNA co-mingling, hybrid seed testing, bio-algae, and for growing in cold climates or barren environments. All air flow is managed by proprietary oil bath fans, which contain a series of oil laden filters and traps to eliminate airborne contaminates and odors. AGT's proprietary Natural Earth Air System locates the mechanical system underground and utilizes the natural earth core air temperatures of 55 to 60 degrees for heating and cooling. In the AGT Greenhouse, a glass ceiling covers the entire grow area encasing the steel framing system between the roof and ceiling. This is important for several reasons: the sealed roof/wall air cavity provides dead air space insulation and the glass ceiling reflects conditioned air back down into the grow area. Current greenhouses on the market have the steel structure open to the grow area, a gross waste of energy requiring heating and cooling of the steel structure. As a consequence, this open steel structure is not sterile because of condensation; mold and mildew can form on the exposed steel framing and contaminate crops leading to product rejection and crop loss. Last but not least, natural daylighting solves prohibitive electric bills often associated with indoor growing using artificial light sources. Both domestic and overseas greenhouse suppliers have wait times of one to two years and use unconventional framing systems. AGT Hybrid Greenhouses use conventional framing members furnished by Nucor Steel and can guarantee greenhouse delivery in only four months including large buildouts. Faster construction times means quicker time to market or accelerated research and development. Despite the quicker delivery and advanced design, AGT Hybrid Greenhouse prices are equal or less than traditional greenhouses. Traditional greenhouses are not what city planner's desire aesthetically and are considered eyesores. In contrast, the overall architectural appearance of the AGT Greenhouse is appealing and accepted by building departments with strict aesthetic standards. Each greenhouse is manufactured to the customer's specific requirements. "Greenhouse technology hasn't really changed that much. What we've done is start from the premise of what growers need most, then reverse engineer to come up with the most advanced greenhouse on the market today," said Terry Van Gelder, President of Ancon Development Corporation. AGT Greenhouses use clear or colored Lexan insulated standing seam roof panels with a 20 year warranty and electro chromatic glass with variable sunlight diffusion at the interior ceilings. The grow areas of an AGT Greenhouse use a reflective floor coating to amplify natural daylighting and offer reflective light panels to direct light under the plant plume, accelerating plant growth. Grow room divider walls and doors are transparent to minimize sun shading. AGT Greenhouses can be easily converted for other uses such as R&D office space; fitness gyms and sports facilities; parts warehouses and more. With sunlight diffusion control, building uses are unlimited. For security, AGT uses eight foot high exterior and interior hard wall products where many traditional greenhouses can be breached with a pocket knife. AGT Greenhouse components are manufactured and distributed by ISO-certified companies here in the USA adding to the American economy. "Cleanroom technology, energy efficiency and fast build times to empower growers"
Ancon Development Corporation, a designer and developer of advanced facilities, announced the launch of its AGT Hybrid Greenhouse, a new approach to advanced greenhouse technology. The hybrid structures have transformed traditional plastic covered greenhouses into modern, insulated, sealed, natural light, cleanroom laboratories. The AGT Greenhouse system is copyrighted and under provisional patent protection due to its proprietary features. 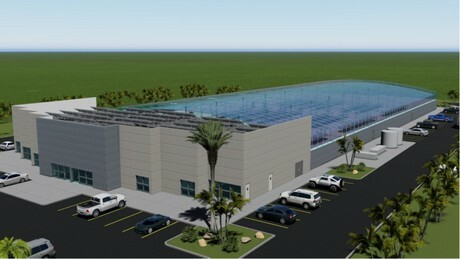 The greenhouse includes a sealed, cleanroom laboratory environment with variable daylighting control, which is suitable for medical plant research, plant testing for new hybrids through DNA co-mingling, hybrid seed testing, bio-algae, and for growing in cold climates or barren environments. All air flow is managed by proprietary oil bath fans, which contain a series of oil laden filters and traps to eliminate airborne contaminates and odors. AGT’s proprietary Natural Earth Air System locates the mechanical system underground and utilizes the natural earth core air temperatures of 55 to 60 degrees for heating and cooling. In the AGT Greenhouse, a glass ceiling covers the entire grow area encasing the steel framing system between the roof and ceiling. This is important for several reasons: the sealed roof/wall air cavity provides dead air space insulation and the glass ceiling reflects conditioned air back down into the grow area. AGT Hybrid Greenhouses use conventional framing members furnished by Nucor Steel and can guarantee greenhouse delivery in only four months including large buildouts. Faster construction times means quicker time to market or accelerated research and development. The overall architectural appearance of the AGT Greenhouse is appealing and accepted by building departments with strict aesthetic standards. Each greenhouse is manufactured to the customer’s specific requirements. “Greenhouse technology hasn’t really changed that much. What we’ve done is start from the premise of what growers need most, then reverse engineer to come up with the most advanced greenhouse on the market today,” said Terry Van Gelder, President of Ancon Development Corporation.